On Thursday Jeremy and I loaded up Kutt and Marvel to make the trip to Prescott, Arizona. We would be being hosted by the Rashid Family at Kytiri Ranch. The drive took 8 hours. The first part of the drive was scenic, then it turned to desert and then rock and then in Flagstaff it was forrest and then back to desert. Prescott is at about 5000+ elevation. It was very hot out so we decided to leave Durango at 2 pm. We arrived in Prescott around 10pm. Terri was there with a smile on as well as her husband Rick. After our horses were settled in a nice BIG paddock we were taken to our sleeping quarters. We fell right asleep. 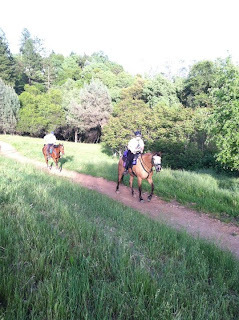 Friday morning we got up and went for a ride with Terri on the trail that we would be using as our evaluation trail. (Terri was supposed to do the trial with us but disappointingly, at the last minute her horse came up sore and it was blocked to the foot so it was just really bad timing.) It was a 3.1 mile out and then turn around and head back. It was a right handed fish-hook out, midway you went by a windmill then continued to a bush, looped around the bush to the trail you were just on and go back to the windmill and hook left to the start point. We were going to do this for 38 miles. The trail had nice footing and we chased some gazelle which was fun. When we were done with the ride it was already very warm. Arizona has a really dry heat. We loaded up the horses and went to the local deli to pick up sandwiches for Terri's family and ourselves.